Bacon Ranch Tater Tots. Is your mouth watering yet? 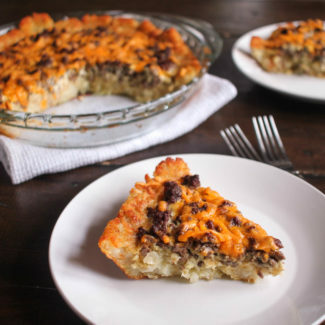 I have taken my favorite breakfast side dish and discovered a way to make it even more delicious. 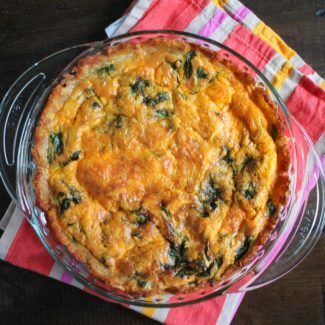 This super simple recipe will make your homemade weekend brunches even better. Tater Tots are a pretty universally loved food. 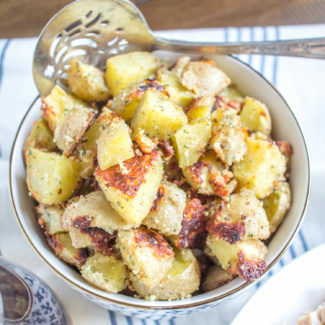 The crispy crunchy bites of potato have only increased in popularity in recent years. These tater tots get an extra burst of flavoring thanks to the addition of crispy bacon, zesty ranch seasoning, garlic, and a touch of parmesan. Don’t worry, this recipe doesn’t involve making tater tots from scratch. Why would you make tots from scratch when there are perfectly delicious tots available in the freezer section? This recipe involves seasoning store-bought tater tots with ranch seasoning, garlic, and parmesan, and then topping them with diced bacon. It is an easy was to give your tater tots an upgrade. 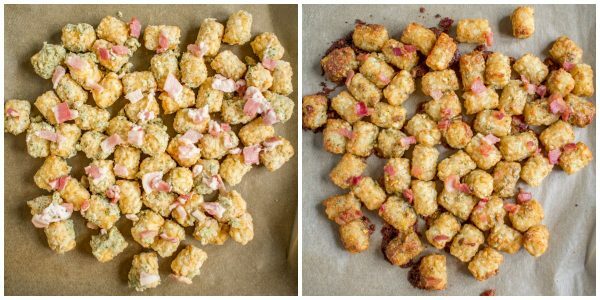 It takes less than 5 minutes of extra preparation time to turn basic tater tots into these Bacon Ranch Tater Tots. You just need to melt some butter and whisk in some crushed garlic, ranch seasoning, garlic, and parmesan. When you whisk it all together it takes on a thick paste-like consistency. Then you stir in the frozen tater tots, and get them evenly coated in the mixture. Once you spread the tots out on a parchment-lined baking sheet you sprinkle the chopped bacon over the top. You should definitely use parchment paper to line the baking sheet. It helps the tots to cook more evenly and it prevents the bacon ranch topping from getting overcooked. I added these Bacon Ranch Tater Tots to the breakfast burrito recipe that I shared on Friday. 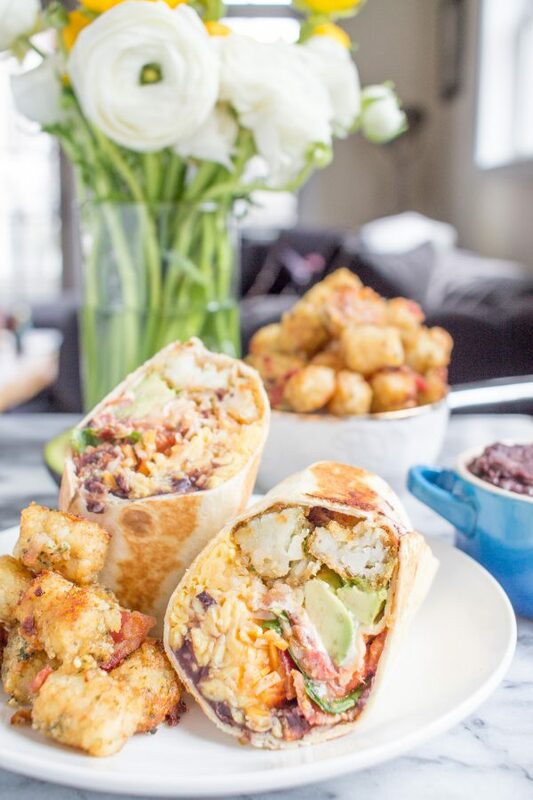 And let’s just say that tater tots are a delightful addition to a burrito. I know that not everyone wants potatoes in their breakfast burritos, but I do! 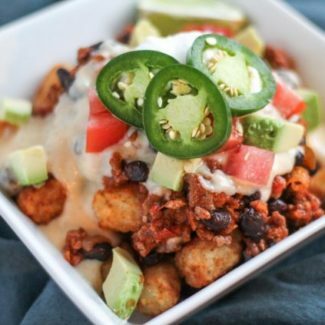 You could opt to use these bacon ranch tater tots to make tot-chos – nachos made with tater tots instead of tortilla chips. This buffalo chicken tot-cho recipe would be especially good with bacon ranch tater tots. Tater Tots are a pretty universally loved food. The crispy crunchy bites of potato have only increased in popularity in recent years. 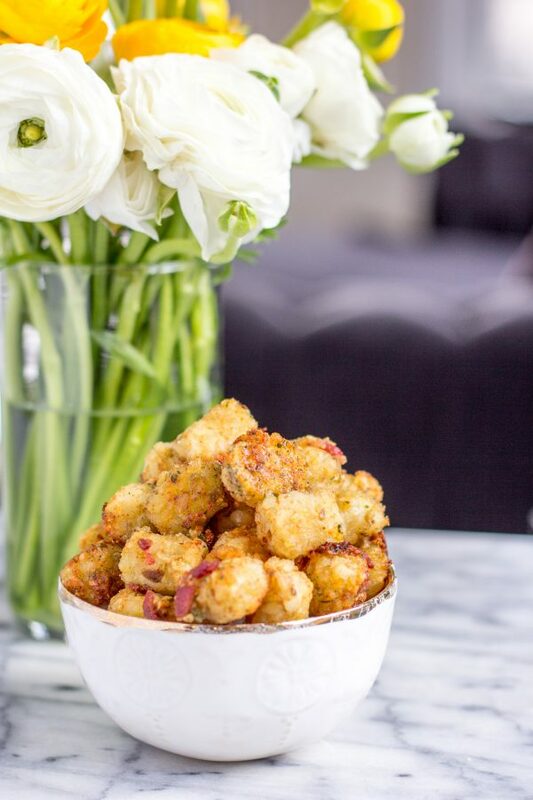 These tater tots get an extra burst of flavoring thanks to the addition of crispy bacon, zesty ranch seasoning, garlic, and a touch of parmesan. Don’t worry, this recipe doesn’t involve making tater tots from scratch. Why would you make tots from scratch when there are perfectly delicious tots available in the freezer section? This recipe involves seasoning store-bought tater tots with ranch seasoning, garlic, and parmesan, and then topping them with diced bacon. 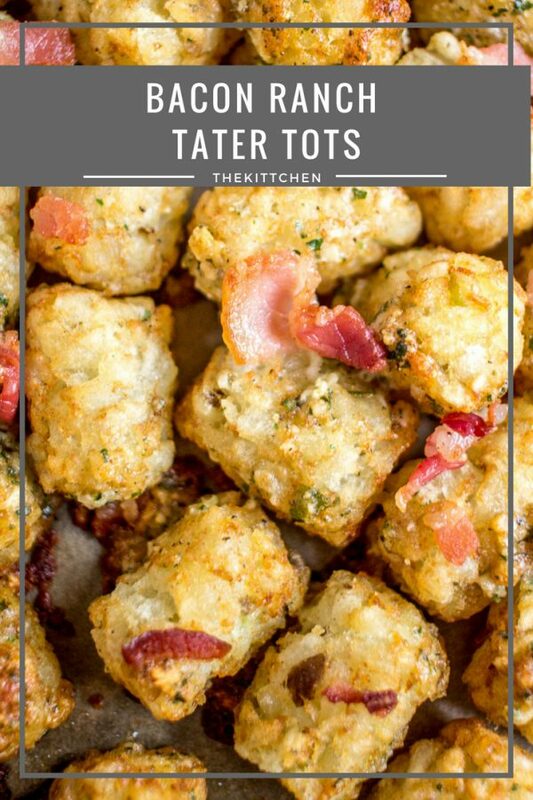 It is an easy was to give your tater tots an upgrade. Heat your oven to 350 degrees. Line a baking sheet with parchment paper. Next, chop the bacon, you want the pieces to be small enough that they will stick to the tots. Melt the butter and pour it into a medium mixing bowl. Whisk in the ranch seasoning, parmesan cheese, and garlic. Once combined, stir in the tater tots. Stir until they are evenly coated in the mixture. Place the seasoned tater tots on the parchment lined baking sheet. Sprinkle the chopped bacon evenly over the top. Bake for about 20 minutes, or until the tots are as crispy as you like them. You should definitely use parchment paper to line the baking sheet. It helps the tots to cook more evenly and it prevents the bacon ranch topping from getting overcooked. I added these Bacon Ranch Tater Tots to the breakfast burrito recipe that I shared on Friday. And let’s just say that tater tots are a delightful addition to a burrito. I know that not everyone wants potatoes in their breakfast burritos, but I do! 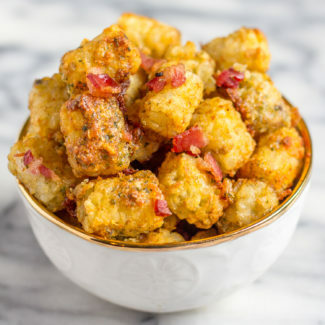 You could opt to use these bacon ranch tater tots to make tot-chos – nachos made with tater tots instead of tortilla chips. This buffalo chicken tot-cho recipe would be especially good with bacon ranch tater tots.